It was a beautiful spring day when I walked down the Via di San Leonardo to the city centre of Florence. On my way I enjoyed the blooming wisteria and the sounds of birds, and I imagined that people could have enjoyed this same route centuries ago. Nowadays, the presence of rushing cars and scooters passing by every now and then clearly makes a difference. Even though you might think the cityscape of Florence has remained the same for the past centuries, in fact some of it has changed. The same is true for the place that I was headed to that day, namely the Villa Gualfonda. On the same spot where now dozens of trains arrive and depart every day, there used to be the villa’s garden, one of the largest gardens within the walls of the city. Decorated with beautiful fountains and antique marbles, long lanes stretched out along orchards and vegetable gardens. While the development of railways and the building of a station in the nineteenth century wiped out most of the estate, the villa still exists today and it is now in use as office for the Confindustria Firenze, the local Italian employers federation and chambers of commerce. 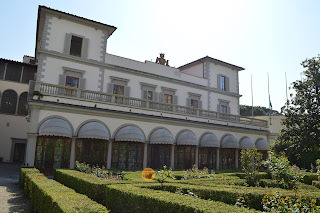 The reason that attracted me to visit this particular villa was that it used to be the home of the Riccardi family which was the main research topic during my internship for the PPP. However, it was not only the home of the Riccardi, but it was also the place where Riccardo Riccardi housed the family’s first art collection at the end of the sixteenth century. Therefore I was very curious to see what it looked like inside. I had an appointment with an employee from the Confindustria whom I will call signore A., and to be honest, I didn’t really know what to expect and was a little nervous. That feeling turned out to be totally groundless, because I was welcomed with open arms and signore A. had prepared to show me every interesting spot in the building. Most of the rooms decorated by the Riccardi, were now used as offices or meeting rooms. 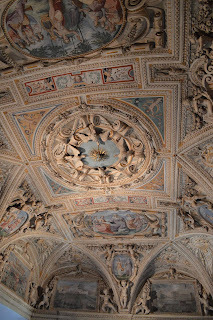 I was surprised by how well preserved everything looked and was pleased to learn that the Confidustria Firenze actually takes good care in restoring the frescoes and paintings that are still there. The presidential office was a stop in my tour, and, regardless of the null relation with the Riccardi, it was entertaining to see. Maybe because the room was filled with bright red Ferrari (yes, like the car brand) furniture. Quite extraordinary I would say. After stepping over some telephone wires, signore A. led me to the roof terrace at the back of the building. Unfortunately, it now overlooks slightly less attractive apartment buildings, but I could imagine how marvelous the view must have been when the gardens were still there. The absolute highlight of my visit however, was the Salone di Maria Medici. 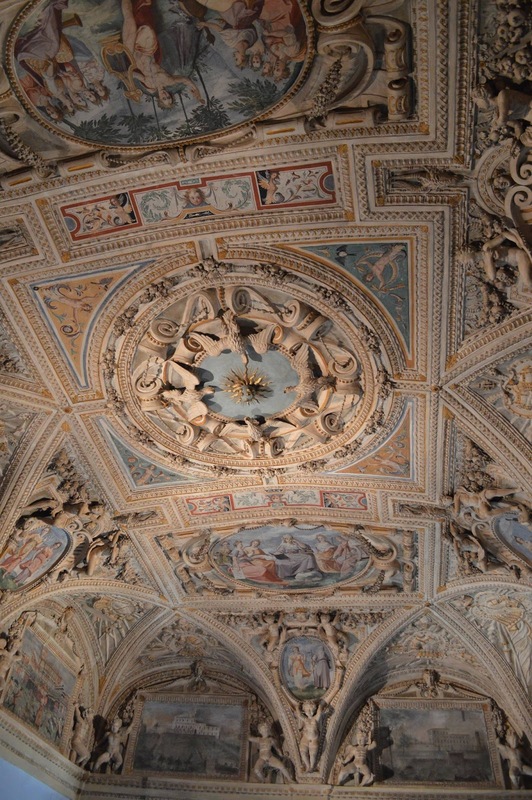 Situated on the ground floor of the building, this room is copiously decorated with seventeenth-century stucco work and frescoes by Volterrano and Jacopo Chiavistelli. The name of the room derives from the anonymous painted scenes showing the festivities in honour of the marriage between Maria de’ Medici and King Henry IV of France. Rich in detail, these frescoes give a good impression of what the aforementioned gardens must have been like. After a short stop in the present back garden, my visit came to an end. However, signore A. could not let me leave without providing some extra information about the history of the building. All in all my visit had been very fruitful and as I walked back up along the Via di San Leonardo, passing the houses covered in wisteria, I couldn’t help myself wondering what it must have been like for a family like the Riccardi to live in the Florence of five centuries ago.